We had the privilege to meet the founders of a very ambitious project, Windwalkers. You may already have clicked on the Kickstarter express link, introducing the concept in a really funny way. Here are two videos and a lot of concept arts images, showing a bit more of the game. Do not hesitate if you have any question about this project, we will do our best to answer them. We'll try to translate our article as soon as possible, but for now it'll have to do. A very original concept, I like it. Finally something different and visionary. We need more bold concepts like this one, I swear. Recently each game I try seems like a total remix of yesterday. Sure, everything is a remix, but those guys have picked great ingredients. 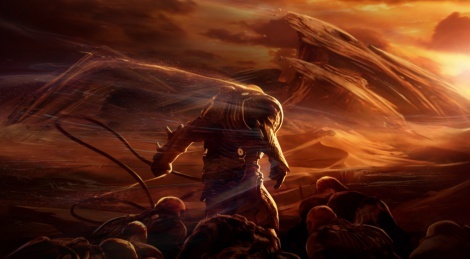 There is a little bit of DUNE, MDK, the art of Giger and Moebius. I really dig this project, and I'm definitely going to support it. Damn, I would love to work on it myself. Some of the art design is nice though, but meh. "THE WIND IS PUSHING ME!" Looks fun and the premise is intriguing, but from here on out it's all about execution. Let's see if they can make this worth playing for more than a week.